ConrailDetr​oit wrote: There were tracks here many years ago, now a trail. Not in Michigan. 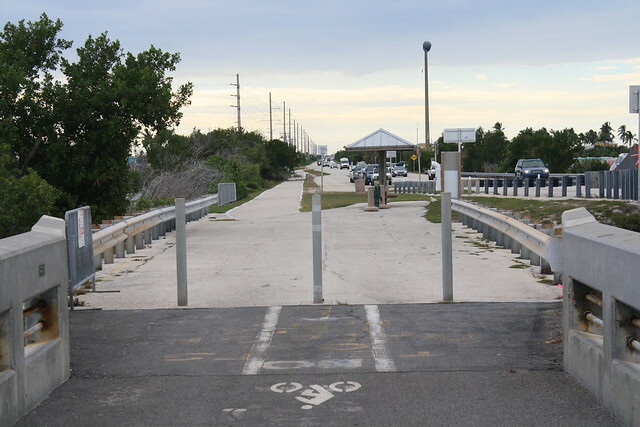 I'm thinking that it is somewhere on the Florida Keys Overseas Heritage Trail. I think you are likely correct. see some blue water, and just makes sense. Somewhere along the Florida Keys Overses Herttage Trail but don't know the exact mile marker but there is a sign with a fire truck icon on it in the distance on the right. blueheron13 wrote: Not a cul de sac. This is actually a T intersection, although one street is newer and may not be in Google maps, though it is in satellite imagery. I quite sure it's the northeast end of Enterprise Drive, just weat of the Oakwood Junction diamond. Indeed, it's Conch Key, Florida looking southwest along the Florida Keys Overseas Heritage Trail, former Florida East Coast Railway Key West Extension to Key West Florida via Marathon, FL. Unscheduled final run of the remaining FEC Railway passenger train, Havana Special, train 75/76 between Key West and Miami, Florida, was made when the Labor day, September 2, 1935 hurricane struck and damaged the Key West Extension. The highway at the right is US Highway 1. My parents and I drove through the Florida Keys to and from Key West back on February 23, 1982. Nope. Different NS line, in Michigan, closer to Ohio. 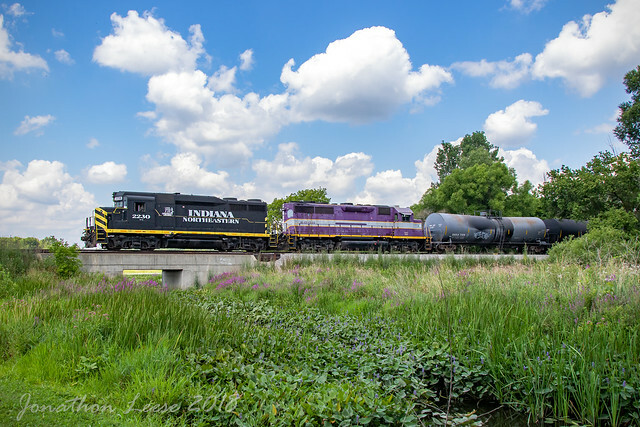 Monroe, Michigan, at the north end of Norfolk Southern's Warner Yard. Photo taken from Spaulding Street looking west. Correct! This segment of Spaulding Rd is accessed from Dixie Hwy. At the north end of Spaulding is a T-intersection with a new, short east-west street. I was facing west on this new street, just east of Spaulding. This was the NS B20 local. Yes, indeed, it's the north end of Spaulding Road at the north end of Norfolk Southern Rr's Warner Yard. The road is west off Dixie Highway (old US-25) in Monroe, Monroe County. Final run of Amtrak train nos. 352/353 between Toledo and Detroit on the former Conrail Detroit Line, was made on April 1, 1995 when that train was rerouted to operate between Detroit and Pontiac. Last edited by railrod1949 on Sun Jan 20, 2019 7:03 am, edited 1 time in total. You are on the river trail between Cavanaugh and Jolly. It was a spur off the MC/NYC/PC etc that went to the cement block dealer or a lumber yard on Aurelius. Dan Cluley wrote: You are on the river trail between Cavanaugh and Jolly. It was a spur off the MC/NYC/PC etc that went to the cement block dealer or a lumber yard on Aurelius. Yes, it's the spur line trestle over the Sycamore Creek looking east towards Aurelious Road between Cavenaugh and Jolly roads It's behind the Dean Transportation bus garage on the west of Aurelious Road in Lansing, Ingham County. The spur line was off the old MC/NYC/PC/ Conrail, now JAIL RR. Final run of the remaining pld NYC (exMC) passenger train between Jackson and Bay City with stop in Lansing, was made on Christmas Day morning, 1959. Montgomery, MI, just southwest of Reading on the Indiana Northeastern. I would've had no idea where that was had I not shot a train there back in August. Long Lake Road. Nice photo SD80MAC. I know I'm probably in the minority but I dig the purple. Michael wrote: Long Lake Road. Nice photo SD80MAC. I know I'm probably in the minority but I dig the purple. Yes, this is looking north along Long Lake Road toward the INER RR line, former the old NYC RR ex LS&MS line that run between Hillsdale and Fort Wayne, IN. These above shots were taken in Camden Township, Hillsdale County, MI. Passenger train service on that line was discontinued many years ago. It's a milke west of M-49. The body of water in these shots above is the the West Fork West Branch St. Joe River.